"The 1st club I ever visited where I saw the DJ dance on top of the console and everyone was having such a great time...and I thought that was just crazy, all these people having a blast because of this one guy." That's where it all started, wondering if she could be on the other side of the console. Pooja started her musical journey in 2009 in Chennai, India, but temporarily gave it up when her passport began to beg for a few immigration stamps and she took up a job travelling the world. After a two-year hiatus she got back behind the decks and has continued her musical prowess. Now based in Dubai, she shuttles around a fair bit for her gigs. After travelling the world, and delving a bit deeper into music, she has since found that she resonates with more of deep-house, tech-house and techno. Her sets are filled with phat, hard baselines and chunky beats, and there is an inevitable groove that always gets your toes tapping. Named one of the “Top 10 Female Dj's in India” recently, Pooja has played her share of clubs and festivals alike. She has recently signed up with the 'Be Massive Records' agency for her European gigs. She is actively involved in the underground music scene in Dubai. She holds a residency with the longest running techno night ‘WARPED’ and is on the 'Third Eye Agency' roster (of Electric Days fame), now holding a weekly rave called Night Vibes. (Budapest, Hungary), playing at the Go:Madras Electronic Music Festival (Chennai, India), Techno Cracks-Off Sonar (Barcelona, Spain) and played for Lord Davenport's Mansion's closing party (Londn,UK). She has played at several known clubs in India and the Middle East like Trilogy (Dubai), Tamanya Terrace (Dubai), Story Rooftop Lounge (Dubai), Sho Cho (Dubai Marine Club), Zoe (Bahrain), Tao Terraces and Warehouse (Bangalore) and Q-Bar, Hilton (Chennai) among many others. Having performed at Sonar (Spain), Go:Madras -The Electronic Music Festival (India), TGIT-Thank God Its Techno (India) and Holi Buzz Music Festival she has a growing number of avid followers who love to dance with her, as much as she does. 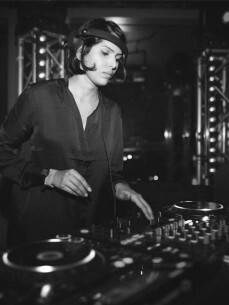 She has featured on lineups alongside some big names like Monoloc (CLR), Sam Paganini (Drumcode/Cocoon/Plus8), Marco Bailey (MB Elektronics), Kate Simko (London Electronic Orchestra), Skober (Drumcode/Phobiq), Scarlett Etienne, Bob Moses, Clarian, Her (Him & Her) and Arjun Vagale (Maktub Music/Tronic) to name a few. You can hear her across the global airwaves on radio stations such as Deeper sounds global radio, Fever fm Ireland, Zurich radio, Ibiza Global Radio and Egothermia Radio.